Elizabeth is an agricultural extension professional awaiting graduation with an MSc in Agricultural Extension Education. Currently, she works at Makerere University’s College of Agriculture and Environmental Sciences as a project administrative and financial support officer on the Gender-responsive Researchers Equipped for Agricultural Transformation (GREAT)-a BMGF funded project that trains agricultural research on gender responsive methods of research. She is also a part–time tutor in the College of Education and External studies where she teaches in-service secondary school teachers of agriculture. Elizabeth’s work experience ranges from promotion of agricultural inputs in the private sector to research and research / communication work in academic and CGIAR institutions, respectively. 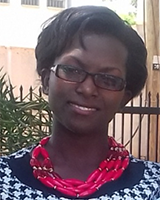 Her research interests include gender, agriculture, human nutrition and adult learning.